The Bear Stand has every conceivable amenity to make your vacation feel just like a personal spa retreat. 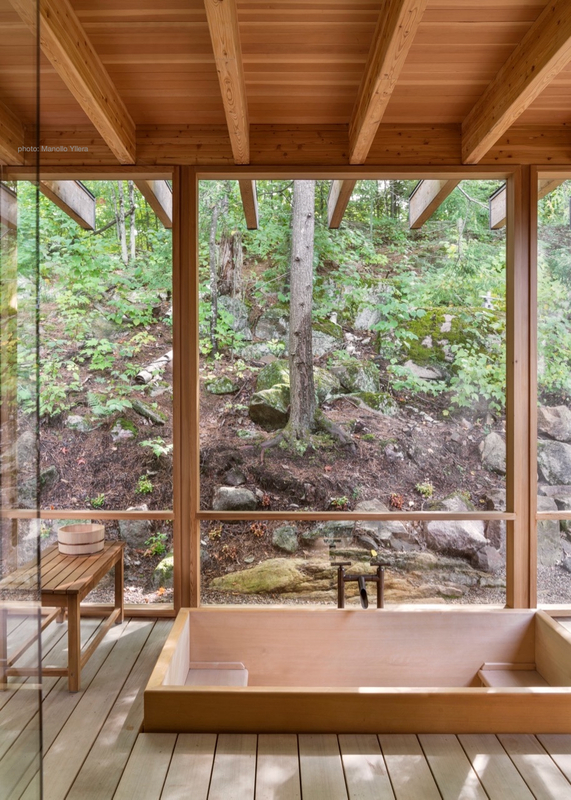 Hansgrohe rain showers throughout the cabin, a secluded wooden Japanese soaking tub, a lakeside hot tub, an outdoor shower and a gorgeous cedar sauna to finish it all off. All yours, no masseuse required. Inspired by the beautiful Japanese ofuros of Kyushu, our outdoor wooden soaking tub is an authentically-crafted hinoki wood gem, oozing with cedar-scented goodness and designed for full year-round use. Quietly situated beside our master ensuite, it's nestled in a fully-screened covered deck, next to a softly-lit granite rise laden with giant pine and hemlock. Perched quietly on the upper edges of our private bay on picturesque Contau Lake, our 6-person, 4-season hot tub is often cited as one of the most enjoyable experiences to be had at The Bear Stand - whether in snowy surrounds, under the dappled summer sun, in the crisp autumn air, or under the stars and amidst our gently lit forest. Imported all the way from Finland, our high powered IKI-Kiuas sauna stove will have you sweating in style, any time of year. With twin height benches, gorgeous cedar strip and rough hewn granite cladding, under-heated terrazzo flooring and all the steamy goodness you could ever ask for, it's an experience not to be missed.